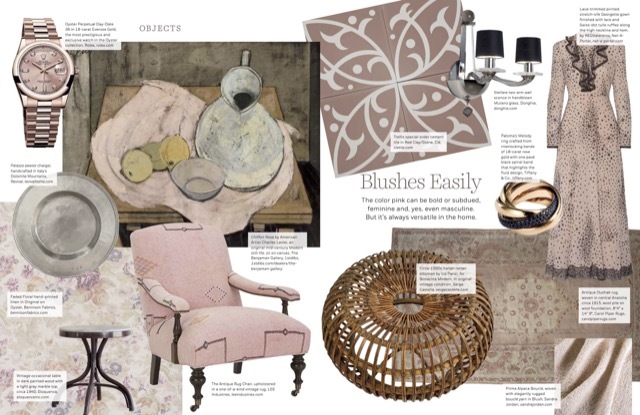 According to the editors of Milieu magazine, the Red Clay/Stone hues of clé’s Trellis cement tiles blush easily! “The color pink can be bold or subdued, feminine and, yes, even masculine. But it’s always versatile in the home.” The selection of products, which includes the Oyster Perpetual Day-Date watch by Rolex in blushing Everose Gold hues, shows the tile to a stunning effect. You can see the full-sized placement by clicking through. Besides the Red Clay/Stone color combination, Trellis comes in Black/White and Federal Blue/Kelly. This series is one of many offerings in clé’s production of cement tiles, their products a modern take on a historic tile that has been referred to by dozens of names during the past 150 years, including encaustic cement tiles, cement tiles, concrete tiles, hydraulicos, cuban tiles, and so on. They have stood the test of time because they have literally echoed their beauty across many continents. The company notes that they create one of the finest cement tiles in the world, a quality that still permeates a surface which is muted, varied, matte and silky. Cement tile patterns and shapes are already impossible to refuse, but it’s the variegated colors that make them one of today’s most sought after tiles for walls and floors, and indoors and out. In fact, the variety of surfaces on which they will work includes floors, walls, kitchen, backsplashes, shower floors, shower walls, places that will freeze and thaw, fireplaces, exterior walls, exterior floors, hospitality venues, commercial venues, and residential settings.